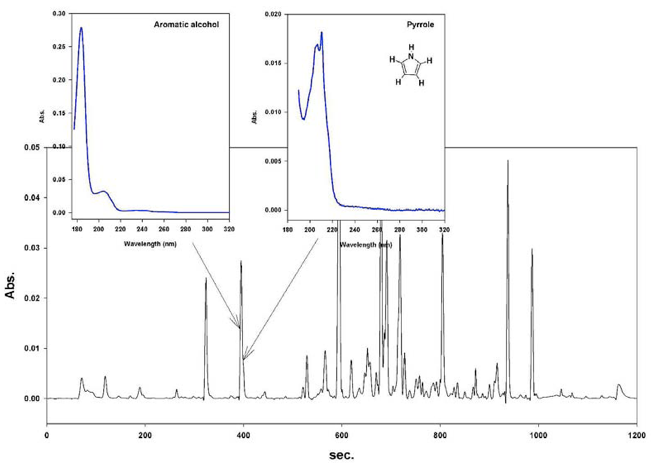 Gas chromatography -UV spectrophotometry (GC-UV) is a full scan analytical method, where the compounds eluting from a gas chromatographic column are continuously monitored. The method belongs to the same categories as gas chromatography mass spectroscopy (GC-MS) and gas chromatography Fourier transform IR (GC-FTIR). Spectra of identification/classification for insufficiently resolved components in a dust sample. 1. Comprehensive qualitative information concerning the identity and chemical class of unknowns in a sample is gained. The method also gives reliable quantitative results. 2. The instrumental construction is relatively simple and compact giving possibilities for making analysis in close connection with the sampling site. This possibility is simplified by the low demand for a laboratory infrastructure. The simplicity also gives short start up time as well as relatively low instrumental cost. 3. The instrument can easily be linked to an external capillary GC, whereby complex sample constituents can be analysed. This implies also the access to all the technology linked to capillary GC as for example autosamplers. 4. The sensitivities are very high both concerning detection limits, identification limits and classification limits. 5. The method is particularly suitable for the identification of structural isomers. 6. Selective analysis can be carried out for most of chemical classes like aliphatic aldehydes, pyridines, naphthalenes etc. 7. In addition to organic compounds also inorganic can be determined with high sensitivity. 8. UV-spectra in the vapor phase are very well defined, which is the bases for the identification. Computer based search for unknowns against a reference library is very well suited for identification as well as for classification of unknowns. UV-spectra are also visually well suited for fast identification/classification.